Emily Hinshelwood is a poet, performer, and community arts facilitator. Winner of the John Tripp Award for Spoken Poetry, she performs her poetry in a variety of settings, including outdoor poetry walks, the sitting rooms in IKEA, sustainability conferences, as well as traditional arts venues. Her recent poetry collection, On Becoming a Fish (Seren), was inspired by a series of walks around the 186 mile Pembrokeshire coastal path. 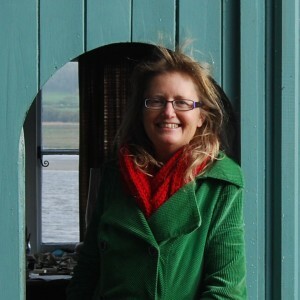 She has won many literary awards for her poems which have been described as ‘edgy and assured’ (Carol Ann Duffy), ‘subtly handled and atmospheric’ (Doris Corti), and ‘crying out to be spoken’ (Herbert Williams). She is especially interested in engaging audiences with poetry and ‘as an artist she tries new techniques and ways of presenting her work, always taking those necessary risks in order to reach out to new audiences’ (Amy Wack). She recently toured with harpist Delyth Jenkins combining her animations and poetry with Delyth’s harp.